Reaching your goals, however, is a bit more complicated. You need to create a goal and action plan to set expectations and to hold yourself accountable. 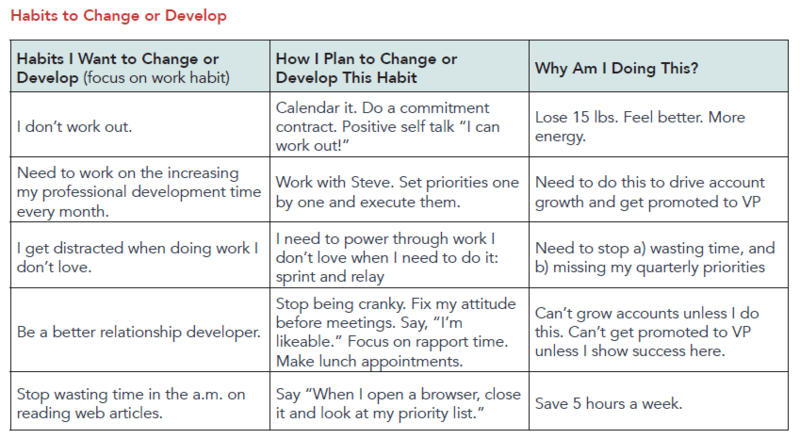 In our Goal Setting Worksheet, we outline a 5-step process that not only helps you set goals, but also gives you the best chance to reach them. Here we provide some goal setting examples, accompanied by visuals from the worksheet, to give you a sense of how to set goals and put actions in place to achieve them. 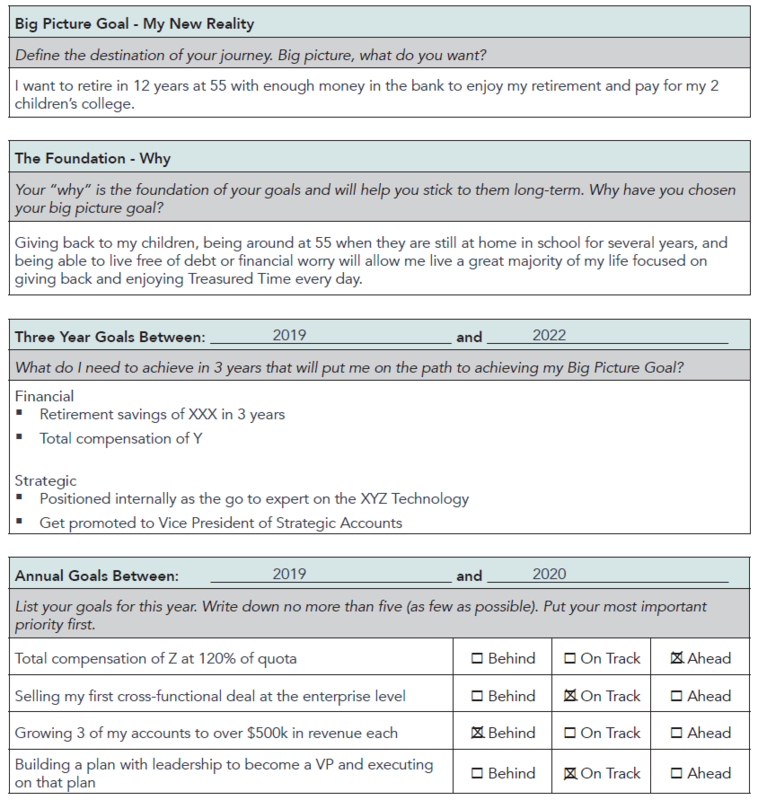 Click here to download our complimentary Goal Setting Worksheet. The first step in the process is to set goals for yourself. Think about your goals in terms of the big picture. Over the long-term, what do you want? 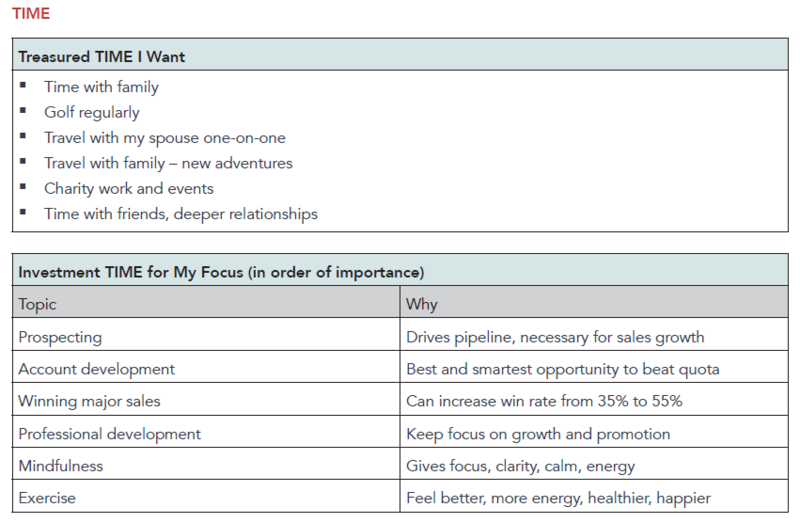 Categorize your answers into big picture, 3-year, and annual goals. Once you're clear about your big-picture goals and know where you want to be, you need to create the path to get there. This is where you answer the question, "How will I reach my goals?" 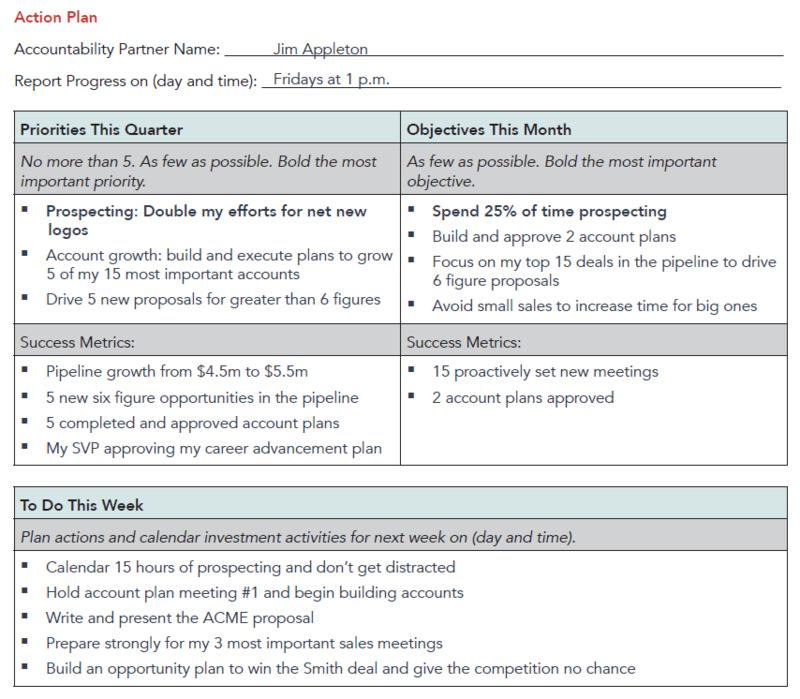 It's important to think about action planning not only in terms of what you're doing today, this week, or this month, but also in terms of your priorities each quarter that will move you toward your big picture goals. Your priorities in the short-term should all tie together, building upon one another to realize your longer-term goals. Keep this in mind as you plan your monthly, weekly, and daily actions. Goal achievement and success is directly related to how you spend your TIME each day. 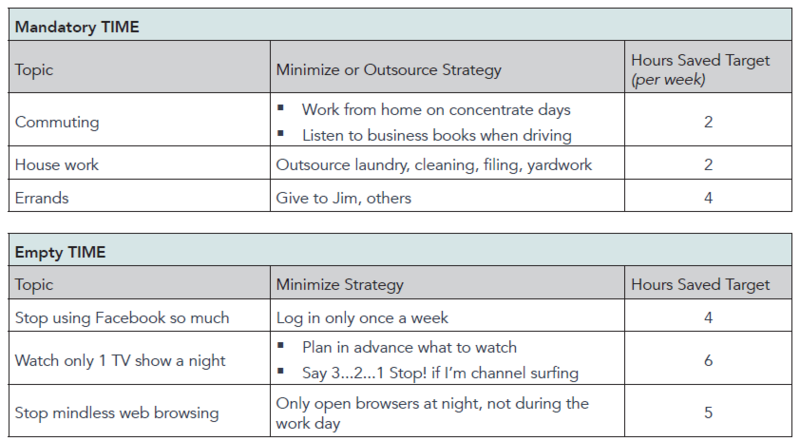 The best goals and action plans are for naught if you don't control your TIME and spend it on the activities most likely to give you outsized returns. The keys to happiness and productivity are to maximize Treasured and Investment TIME and to minimize or outsource Mandatory and Empty TIME. Here are a few examples of activities at each level. Note that categorizations are highly individual. What may be considered Mandatory time for one person could be considered Investment or Treasured for another. If you're committed to reaching your goals, you need to become impossible to distract. Too often, we don't achieve our goals because we get sucked into other people's priorities. When we do, we sacrifice our own. All the examples above are from our Goal Setting Worksheet. You can download it here for free. The worksheet includes step-by-step instructions along with goal setting examples. 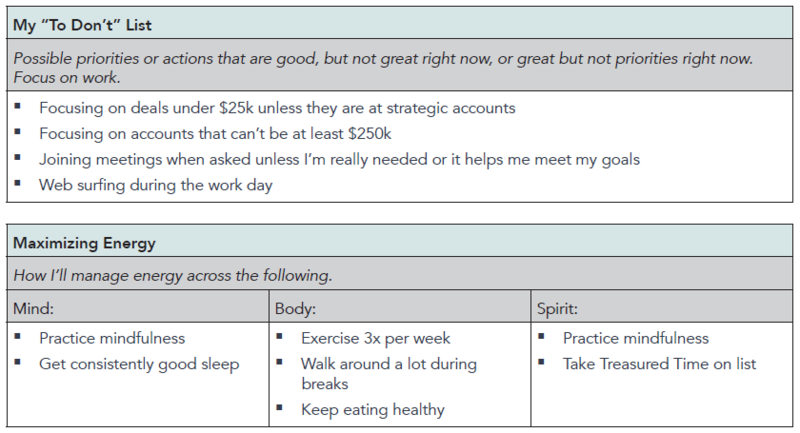 Whether you use our Goal Setting Worksheet or your own, make sure you cover these 5 areas to ensure you not only create a solid goal and action plan, but also use it.